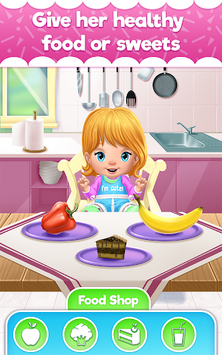 Bella needs you in a baby game and you should offer her all the care she asks. If you thought that being a baby is hard, then try to be an adult for few minutes and see how it's like to take care of a little girl in this virtual parenting challenge. You will get through 4 major steps that will gently introduce you to the right way a baby should be taking care of. Also, you will have a permanent guide during this baby game because each task will be followed by instructions and it's actually easier than in real life because the baby will show you exactly what she will need and when you just have to pay attention. As you can see in the imaginary bubble of thoughts Bella wants to go to the bedroom where you will need to change her diaper with a fresh one, then you will check her temperature to see if she feels ok. Apply that medicinal mixture on the bumps to make them disappear and right after you have to turn the light on to put her to sleep. After the napping time is over she might ask you food, take her in the kitchen and feed her. You could even buy another type of food from the store if you like to change the menu. Now that she is full she might ask you to take her to the potty chair so she can use it. Last but not least is the dressing up the part where you put on nice piece of clothing appropriate for Bella, change her haircut, maybe add some nice accessories. Play with colors and textures and you will see what a beautiful outfit you can create.